The King Salman Humanitarian Aid and Relief Center (KSRelief) continued distribution of heating fuel in the northern Syrian, where 50,600 liters of heating fuel has been distributed to 506 Syrian families in the camps of Jabal, Al-Tahoun, Al-Hadas, and Baza'a, . The aid comes to provide heating fuel in flood-affected camps as part of a project to improve the standard of living and community empowerment in the north of Syria. A team from KSRelief distributed 1,406 blankets and 703 food baskets, weighing 52 tons, to Syrian refugee families in the town of Arsal in the Lebanese Bekaa Governorate. The distribution comes as an extension humanitarian aid athat Kingdo of Saudi Arabia exert, represented by the Center, to alleviate the suffering of Syrian people inside and outside Syria. The clinics of the King Salman Humanitarian Aid and Relief Center provided medical and therapeutic services to 4,434 Syrian refugees in the Zaatari camp in Jordan during the fourth week of January. It is noteworthy that the clinics of the Center inside the Zaatari camp work to provide a safe environment for the health of Syrian refugees in the camp, through the excellent medical staff and modern medical equipment. 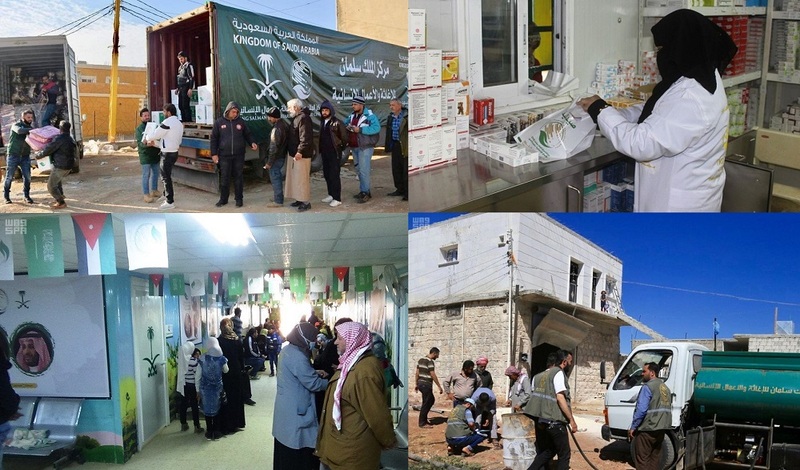 KSRelief Clinics provided also more than 3,503 prescription to Syrian refugees in the Zaatari camp in Jordan during the fourth week of January. It is noteworthy that the pharmacy clinic of the Center is working to provide all the therapeutic and medical supplies for patients from the Syrian refugees, including chronic diseases of different needs according to medical requirements of each case.